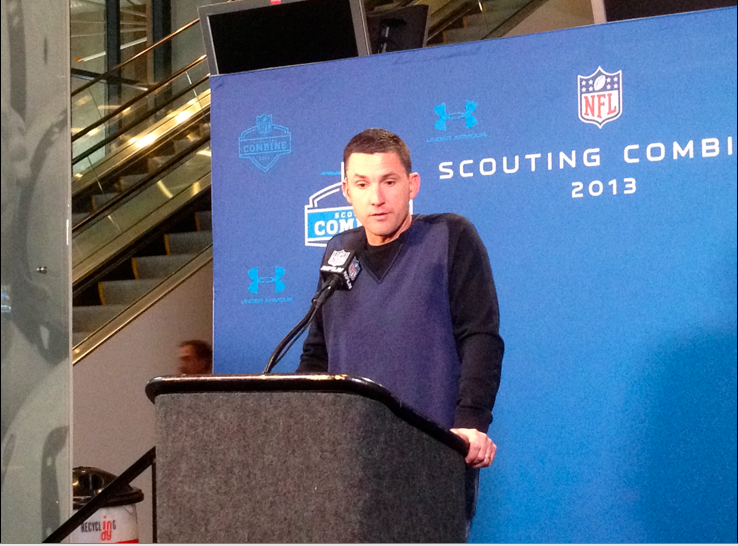 Oakland Raiders Head Coach Dennis Allen speaks to the media at the 2013 NFL Combine. Allen and the Raiders will travel to Indianapolis this fall for a regular season matchup. For the first time since 2004, the Oakland Raiders will head east for a regular season matchup with the Indianapolis Colts. The Raiders coaching staff has had a very busy offseason taking part in the Senior Bowl by coaching the North team. “It was an outstanding experience for us, for our staff to be able to be there and see those players up close and personal and evaluate, not how they play the game of football, but really what types of people they really are,” Allen said. Allen and his staff feel that they have a bit of a leg up on some of the other team’s around the league after spending a week in Mobile working hands-on with numerous players that will hear their name called come late April. After a 4-12 regular season, the Raiders carry the No. 3 pick into this year’s draft and will evaluate all options in helping to improve their roster. “What we got to do is we’ve got to begin to identify what’s out there and what’s available in the draft as well as through free agency, both with our own players we had last year and also with what’s out there on the market and try to categorize where you think you might be able to fill needs, whether you’re going to do it through free agency or whether this is a draft that’s deep enough that you can do it through that,” Allen said. In Allen’s first-year as Raiders head coach, Oakland was 3-4 heading into the month of November and in the middle of a crowded AFC West. The Raiders sputtered down the stretch, losing eight of their last nine and never scored over 21 points. Allen is optimistic though that with an established staff, there will be success in Year 2. “Last year it was the Senior Bowl when I got hired,” Allen said. “We’d just completed the staff and really gotten our feet on the ground.